Subjects and Themes(Dreaming): Bush tucker, Awelye, Bush medicine, Kangaroo. movement, and for being the artist whose work has achieved the highest price at auction for an Australian Indigenous artwork. Her life began in the remote Mt. Allan, to the north west of Alice Springs, in Australia's Northern Territory. She married Heath Ramzan Tjangala, and has had six children. Michelle, her sister Gabriella and brother Lionel, were taught to paint by their highly talented father. She began painting at a young age in the mid 1980's and to this day, carries on the traditional stories, style and much of the iconography of Clifford Possum, albeit with stronger colour and the addition of women's ceremonial stories and other women's dreamings. These include stories from Yuelamu, her home country of Mt Allan, and are often aerial maps of her country, describing the various important sites she knows well. The traditional and semi figurative iconography she inherited from her father features strongly in her works. She also paints the seven sisters, bush tucker stories including bush coconut, seed, and exploding seed dreamings, fire dreamings, worm dreamings, goanna dreaming, and grandmother's country - many of which she works together in a riot of complex interwoven design. Her works are popular because once the iconography is understood, they make fascinating 'pictures' to the westerner, populated not only with plants, food items, waterholes etc. but also with people sitting in the landscape, the men with hunting implements and the women with digging sticks and coolamons. Her first exhibition was a family group show in Brisbane, 1987, where her works were exhibited alongside those of her Father and sister Gabriella Michelle currently paints in Melbourne, where her family now live, often painting in the company of her sister Gabriella. Michelle’s paintings predominantly depict a series of Dreaming stories passed down to her from her paternal grandmother” Long Rose Nungala” and other senior women. Dotting is extensively used throughout her work to showcase the topography of the country. 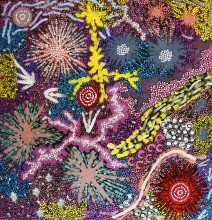 She has painted the land and activity of her Grandmother's Gold Country near Mount Allen, Northern Territory. The painting depicts women (U shapes) collecting bush food in abundance in the desert landscape. 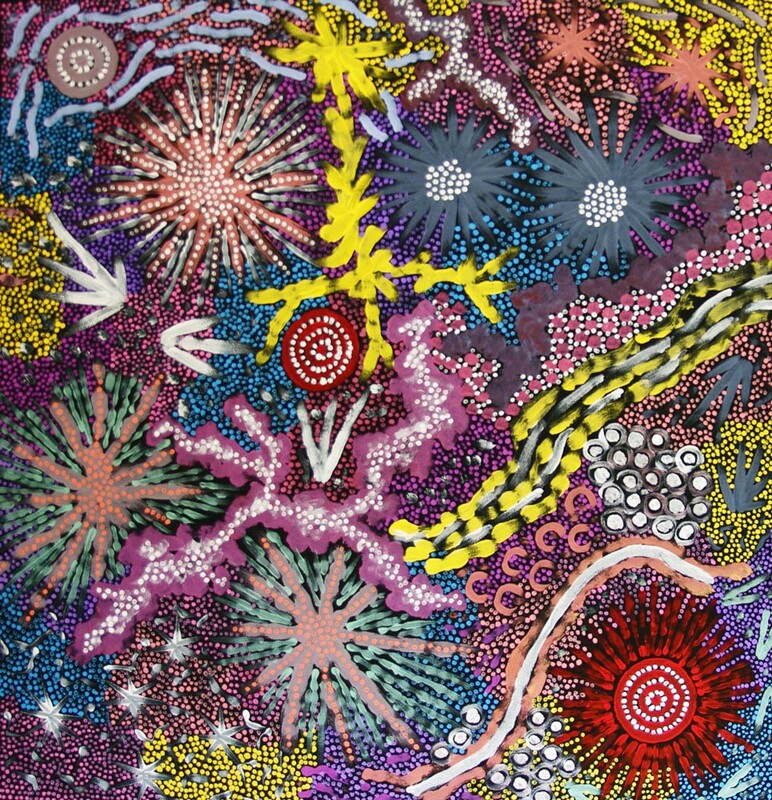 The painting represents an important place for the artist and her family, with waterholes, meeting places, changing vegetation and a variety of bush foods including plants and animals which are an important food source for Aboriginal people.